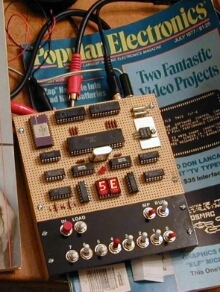 The COSMAC ELF was an RCA 1802 microprocessor-based computer based on a series of construction articles in Popular Electronics magazine in 1976 and 1977. Through the back pages of electronics magazines, both Netronics and Quest Electronics offered low-priced kits that were based on this design. The system was a very early personal computer. It was operated without built-in ROMs and programs were entered directly with help of the CPU integrated DMA. The ELF featured a set of toggle switches or a hexadecimal keypad for input and two hexadecimal LED displays for output. The base configuration had 256 bytes of RAM, but expansion boards could raise that to 4K or even 32K of RAM. In 1977, RCA released their own commercial version of the ELF, the RCA COSMAC VIP for $275. In 1978, the Netronics ELF II was released, which was a cheaper and improved version of the original. It was called the “world’s most practical computer” and sold as a kit for just $99.95. COSMAC ELF was posted on Friday, October 17th, 2014 at 7:03 am. This post is tagged and is filed under 1970s, 1976, COSMAC, Single Board. You can follow the replies through the comments feed. Pings are closed but you can Leave a comment! A Blueberryware theme › 37 queries in 0.347 seconds.